The Atom swoops into Diving Turn. Approaching the bridge between West Bend and Diving Turn. Slitted slicks in the rain straddle fun and scary. Jalopnik’s deputy editor John Krewson would never be frightened in a Honda-engined hyper-gokart. Lime Rock Park is rather scenic, especially on a late summer day with clouds coming off the mountains. An uphill corner on the autocross track. Mark Swain is the VP of sales and marketing for TMI, the company which builds the Atom for the American market. He also happens to be one hell of a driver, as demonstrated on numerous occasion with the Atom on a not particularly dry track. Remember when you were a kid and you rode in shopping carts? Very similar. You could poke your hands through the exoskeleton if you were foolish or in possession of unneeded hands. The Atom was towed to the track by a big old Ford F-450. 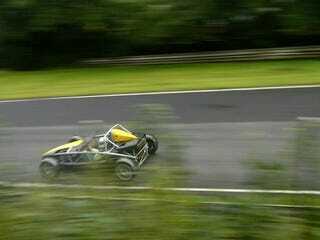 Sometimes in the rain, there is oversteer. No need to worry. Sometimes there is even more oversteer. The Atom corners much better than the position of the cones would suggest. Approaching Uphill at the end of No Name Straight on the main track. Uphill is, as the name would suggest, a rather steep section. Mr. Krewson is ready for his 5 MPH parking lot run. If it came in orange, Bugs Bunny would love it. By all means visit Lime Rock Park. Did I mention it’s gorgeous? The bottom of Diving Turn, on the way to the Main Straight. Cornering well on a steamy midmorning. Approaching a turn on the autocross track during a gloomy point in the day. Lime Rock Park lacks the overzealous security fencing found at most modern racetracks. Which makes it feel like the Nordschleife of the 60s. A mesmerizing racetrack this one is.